Monday September 18th 1899 It was a nice day. Will went out to Hedges for the plums. Luther helped me wash. Henry was working at the house again. I took a ride in the afternoon to see if I could get a girl. Will went to town. It was fifteen years today since Rob was buried. 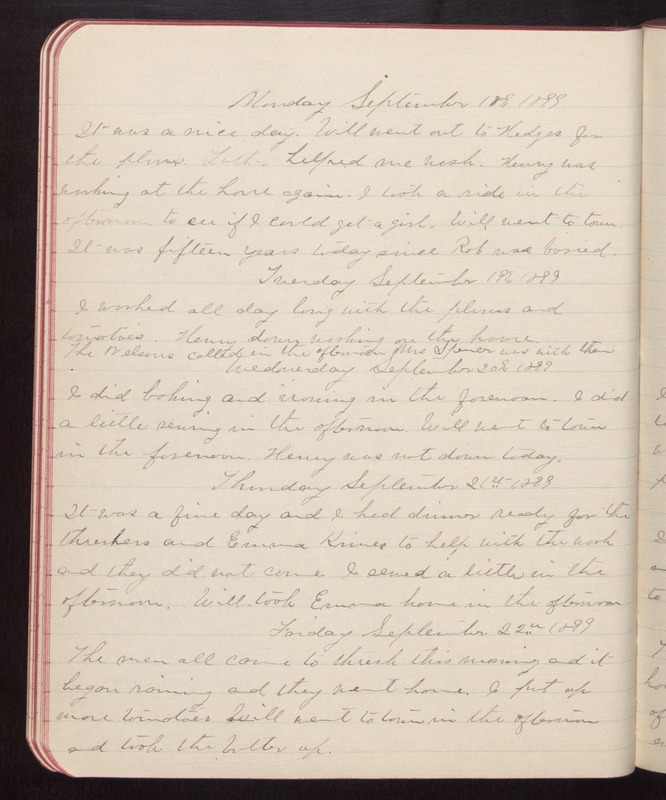 Tuesday September 19th 1899 I worked all day long with the plums and tomatoes. Henry down working on the house. The Nelsons called in the afternoon Mrs Spencer was with them Wednesday September 20th 1899 I did baking and ironing in the forenoon. I did a little sewing in the afternoon. Will went to town in the forenoon. Henry was not down today. Thursday September 21st 1899 It was a fine day and I had dinner ready for the threshers and Emma Krines to help with the work and they did not come. I sewed a little in the afternoon. Will took Emma home in the afternoon Friday September 22nd 1899 The men all came to thresh this morning and it began raining and they went home. I put up more tomatoes. Will went to town in the afternoon and took the butter up.